Panicum miliaceum is an annual, large, C4 grass (Downton 1971), to 60 cm, stout, from thick, white roots, sheaths and internodes very hairy, hairs to 0.4 cm long, nodes with both long and short hairs. Leaves alternate, large, corn-like, to 40 cm long, 2 cm wide, blade dark green, smooth, rounded at base, ligule a band of hairs about 0.2 cm long. Flower spikelets large, 0.5-0.6 cm, tips pointed, first glume 5-veined about half as long as second glume and sterile lemma, these both with 5-9 green veins contrasting with pale background; inflorescence large to 20 cm long, often nodding, appearing densely beaded from large abundant spikelets, primary and secondary panicles flowering and fruiting at same time, base of secondary panicles remaining enclosed in leaf sheaths. Fruit pale tan to brown, Aug-Oct.
Habitat: Open, waste places, soil pH 5.8-6.8 (USDA, NRCS 2010). Notes: Collected Aug 13, parking lot on 104th St.; Metro N. RR trestle area 98th St. Used in bird-seed mixes. Also used extensively as a food crop in Africa, Asia and Russia. Also grown as a forage crop (Magness et al. 1996). 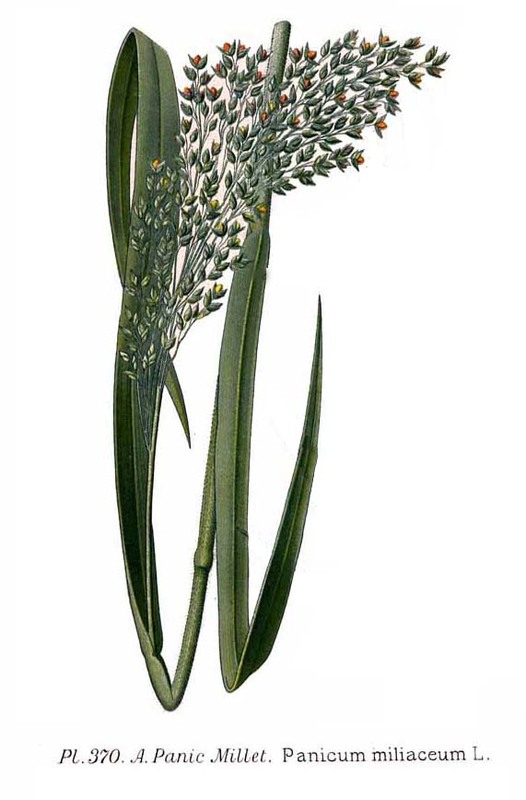 An agricultural invasive in some states (Uva 1997).